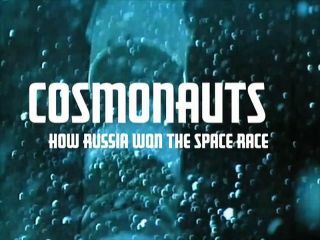 Title screen for the BBC documentary, “Cosmonauts: How Russia Won the Space Race,” airing on KCET in California on Feb. 5, 2016. Fifty-five years after Yuri Gagarin became the first human to launch into space, a documentary about the Soviet space program seeks to reveal how Russia actually "won the space race." "Cosmonauts," airing on KCET in Southern California tonight (Feb. 5), presents, in an hour and a half, the history of Russia's space efforts, using interviews with some of the Soviet-era spacemen and footage unearthed from the country's rarely seen archives. Originally produced by the BBC for broadcast in the U.K., "Cosmonauts" looks at the first half century of space exploration from a different perspective than most American-made retrospectives. "After decades of secrecy, they are now free to tell the extraordinary stories of how they risked everything to take the first steps into space," McGann continues. "This is the remarkable, and at times terrifying, story of the cosmonauts." The launch of an early Soviet R7 rocket from "Cosmonauts: How Russia Won the Space Race," airing on KCET in California on Feb. 5, 2016. As the documentary recounts, the Soviet Union successfully beat the United States to many of the first milestones during the first eight years of the space race. Russia put the first satellite into Earth orbit, Sputnik, in 1957, followed by the first living creature to do so, a dog named Laika. Gagarin's April 12, 1961, Vostok 1 mission was succeeded by the first concurrent spaceflights by two cosmonauts, and then the launch of the first woman in space, Valentina Tereshkova, in 1963. Finally, cosmonaut Alexei Leonov became the first person to walk in space, in March 1965. "I was above the Earth and could look at whatever I wanted," Leonov recalls during the program. "And yet my place in the universe was so small. It is hard to imagine. Only there you can feel the greatness, the enormity of all that is around you." The Soviets' ability to do so much so quickly, the documentary explains, is in large part attributed to two factors: the country's post-World War II development of much heavier bombs required a much larger rocket, and the leadership of Sergei Korolev, who, due to concerns for his safety, was publicly known only as the "Chief Designer" until his sudden death in 1966. "All the spaceflights made in my father's lifetime had one thing in common: Each successive flight involved something new," Natalya Koroleva, Korolev's daughter, says in "Cosmonauts." But even Korolev was not able to overcome a mounting problem in the race with the U.S. to the moon: the budget. "Korolev said, 'We have to build a new launcher, and it will be expensive,'" Sergei Khrushchev, son of late Soviet Premier Nikita Khrushchev, says in the documentary. "And my father asked how much. And Korolev told him, 'I don't know, but it is not important.'" "My father answered, 'It is not important for you, but it is very important for me. We in the Soviet Union have other priorities. We need to increase production of food; still we have shortages. We need to build more and more homes. And I don't want to spend all this money to beat Americans on the race to the moon,'" Khrushchev recounts his father saying. Ultimately, Korolev would design a larger, much more powerful rocket to reach the moon, the N1 rocket, but he would not live long enough to see it fail. Nor would he see the tragedies that would come for the Soviet space program in the years to follow, including the loss of cosmonauts on the first Soyuz and Salyut space station flights. But despite that and other setbacks, the Soviets, and then Russia's newfound focus on orbiting space laboratories, would ultimately influence not just the course of their own space program, but NASA's and the rest of the world's. Today, the International Space Station is a product of the lessons learned by Russia after decades of launching and operating space stations. "The Soviets may have lost the race to the moon, but our continued presence in orbit owes everything to the Russians' determination to conquer space," McGann states toward the end of "Cosmonauts." The documentary, which is also available for streaming online through PBS stationsacross the United States, also features interviews with cosmonauts Georgi Grechko, Alexander Laveikin and Alexander Lazutkin, as well as British-born NASA astronaut Michael Foale and historian Asif Siddiqi, whose 2011 book, "Challenge to Apollo" is widely considered the definitive story of the Soviets' attempt to beat the Americans to the moon. For more details about "Cosmonauts" and for additional broadcast times, see KCET's website.